Advances in weight loss treatment have yielded both surgical and non-surgical options for patients who are trying to lose weight and change their lives for the better. While Dr. James Parrish offers a comprehensive range of bariatric surgery options here at Mid Louisiana Surgical Specialists, he also offers a new, FDA-approved weight loss treatment technique that does not require surgical intervention: it’s called the ORBERA® Managed Weight Loss System. ORBERA® involves the use of an intragastric balloon placed inside the stomach for a temporary period of time. Once inflated, the balloon takes up space in order to help you feel full much sooner than usual while eating. *A clinical study showed that patients who had the ORBERA® gastric balloon for six months lost an average of 21.8 pounds. With continued weight management under the ORBERA® system and good eating and lifestyle habits, even more weight can be lost. The ORBERA® system can be performed in patients over the age of 18 and has helped many individuals successfully navigate the path to better health. 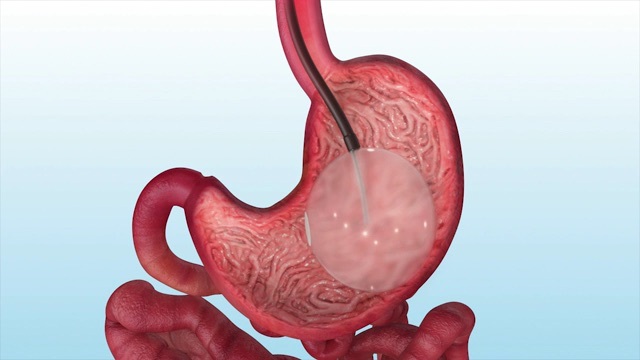 Here is how the ORBERA® system works: our experienced bariatric surgeon will endoscopically insert a small, deflated intragastric balloon down the throat and carefully place it in the stomach. There are no incisions required, and a mild sedative is typically enough to minimize discomfort during this quick outpatient procedure. Once the balloon is in the ideal position, Dr. Parrish will fill it with a saline solution. It should ultimately be about the size of a grapefruit once inflated. In most cases, the ORBERA® procedure can be completed in approximately 30 minutes. The balloon will remain inflated for six months. After this amount of time has passed, Dr. Parrish will deflate the balloon and remove it from the stomach. This begins the second phase of treatment with the ORBERA® Managed Weight Loss System. A team of weight loss experts and coaches, which can include our bariatric surgeon, a dietitian, and an exercise physiologist, will help you continue with good eating and fitness habits to keep losing weight (and maintain your weight loss) safely and effectively. This medically supervised weight loss program is designed to assist you as you adjust to new dietary and lifestyle habits. With a team approach, you will have a comprehensive foundation of support as you embark on your weight loss journey! You have many options when it comes to weight loss procedures. To help you determine which one is best for you, Dr. Parrish has provided answers to some of the most commonly asked questions about the ORBERA® intragastric balloon. Ready to learn more? Talk to our skilled medical team to set up a consultation and find out if this or another weight loss technique is right for you. How much weight can I lose with ORBERA®? What makes this technique so effective is that it works in conjunction with a physician-directed diet and exercise regimen to achieve more pronounced weight loss than diet and exercise alone. In general, you should think of ORBERA® as a tool that enhances your ability to lose weight, an ability that already resides within you. Each person’s experience will vary slightly, but in general patients tend to lose between 20 and 30 pounds with this method. Greater weight loss can be achieved over time by adhering to the newly established lifestyle and maintaining healthy habits. Will I gain back the weight when the balloon is removed? We spend a great deal of time and consideration helping you become comfortable with a prescribed diet and exercise regimen. The ORBERA® balloon simply acts as a catalyst to jumpstart your weight loss. By acclimating you to a different way of living, one that is healthier and more active, we can assist you in maintaining your weight loss and potentially losing more weight in the future. In the event weight gain occurs, we will work with you to reestablish the habits that helped you succeed both while the ORBERA® balloon was in place and soon after it was removed. The ORBERA® intragastric balloon underwent extensive testing to ensure the highest levels of safety. As a result, a leak or deflation is a very rare occurrence. If you notice that you are suddenly no longer feeling full after eating the same way as you had been with this method, a simple X-ray can be performed to check on the balloon to see if it is functioning as intended. If necessary, the balloon can be removed the same way it would when the six-month program was complete. In the unlikely event you need to remove your balloon ahead of schedule, you and Dr. Parrish can decide whether to replace the balloon or to try another approach. Many insurance companies offer significant coverage for weight loss procedures; however, the ORBERA® Managed Weight Loss System is recently FDA approved and may not be covered by all medical insurance plans. Our practice works with many medical agencies, and we can help you determine if your provider covers this treatment. If coverage is lacking, or if you prefer to pay out-of-pocket, we work with several medical financing companies that offer low- and no-interest plans with both short and long terms. Can I have another weight loss procedure after trying ORBERA®? Many people experience success using the ORBERA® intragastric balloon. This method, however, does not preclude patients from using another bariatric technique in the future for any reason. Dr. Parrish will review all your options with you during your initial consultation, including discussing whether an alternative surgical approach may be right for your needs and characteristics. Our primary goal is to provide exceptional ongoing care, and we will work with you to find a solution that maximizes your results. Do you have questions about ORBERA®? If so, please contact us today. We will be happy to talk more with you about this procedure, or help you schedule a consultation with Dr. Parrish.